4. Blue font = unintelligible & unknown words in original text. 1. Who was this Donald Grant of Inverlochie? Where and when was he born? Occupation? Land owner? 2. Who was his wife? Other than John, his executor, who were his children? 3. Was he buried at Elgin? Is there a record of persons buried in or near the church in Elgin, or cemeteries there? 4. Who was Robert Grant in Croftain? Was he related to Donald Grant? 5. Who were John Stuart, John Junken, and John Martines in Ruthven? 6. Who were Jean Stuart Relect of the deceast James Gordon Mitchl ? Relations of Donald Grant? 36. Masters Andrew Belfour _____ Cautiones Capt. 38. and ninety four years. 1. Who was this John Grant? Parents? Wife? Children. 2. Where & when was this John Grant born? 3. Where was he in Jamaica? During what years? Occupation? 4. Who was Lieutenant James Grant of Bellentomb? 5. What does "brother german" mean? 6. Who was Sir James Grant of Grant Baronet on the death of Mary Grant residing at Ellach? 7. Who was Humphrey Grant Esquire late of t he Island of Jamaica? 8. How should the expression "late of" be interpreted? 9. Who is Masters Belfour? 10. Who is Capt. John Grant of Rippachy? A relation? · This contract was drafted in 1840 and entirely hand written. · Content of each line as in the original document. · Grammar and punctuation as in the original document. · Text which is Italicized and underlined are written in and specific to the individual entering the contract. 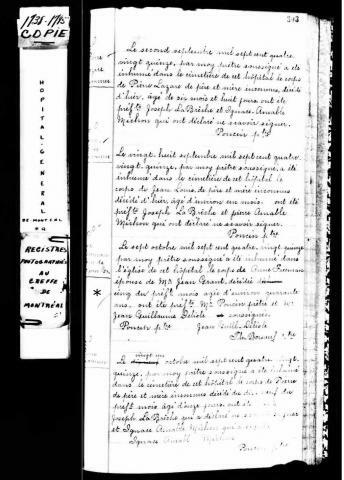 · ‘Blank’ lines are as in the original document. · Chief Factor: Each fort or post was commanded by a Chief Factor and his council of officers. · Angus Cameron: (1782 or 1783) Born in the parish of Kirkmichael, Banffshire, Scotland. Son of James Cameron and Janet Farquharson. Nephew of Aeneas Cameron, son of Alexander Cameron and Grace Grant. Came to Canada on his own in 1801. First partnered with the Northwest Co.; joined the Hudson’s Bay Company following the 1821 amalgamation. His three children preceded his return to Scotland in 1843. Nothing is known about their mother, except that she was probably an Indian woman who remained in Timiskaming. Angus Cameron died at Nairn, Scotland, 11 Aug. 1876. 19. following. That is to say. 20. Indian Country aforesaid. To Mr.
18. Making part of this act. 21. N.P. + initials Not. Pub. Grammar and punctuation are as in the original document. Content is line for line as in the original document. Blue text indicates original text was illegible. Gwyn Owen Radford, Gaoler during Cuthbert Grant’s internment. 8. making part this act approved. *	"Mrs. Ann Dobie died the 25th Dec'r, was buried Dec 27th"
This document, found by Virginia Mason of Hampshire, England, is a remarkable discovery. Almost nothing was known of Ann Freeman: she was an Indian woman who married Richard Dobie and they had one daughter, also named Ann. Until this document surfaced, the relationship between Richard Dobie and Ann Freeman was presumed "custom of the country." 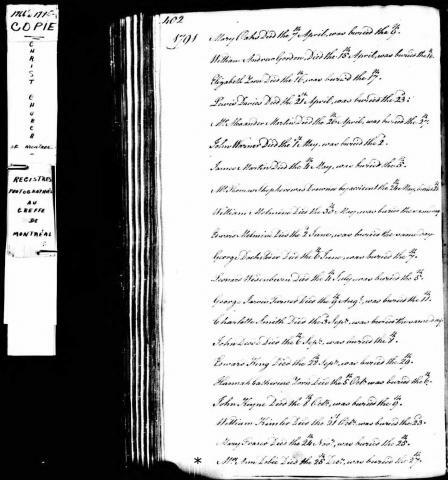 With or without a marriage record, it is evident from this entry that Ann Freeman was considered Richard Dobie's wife. Virginia also found the death record of Ann Grant. That document (below) provided her age at the time of her death -about forty years. This means Richard Dobie and Ann Freeman were married c1755. Richard would have been about 24 years old and Ann somewhat younger. It is apparent that they remained together, in the Montreal area, until Ann's death. She predeceased Richard by fourteen years, and her daughter by only four years. For more details, see Biographies. *	Margin - (cut off; partially visible): "Ann Freeman wife of Jean Gr." "The seventh of October seventeen hundred ninety five I priest undersigned buried in the church of this hospital the body of Ann Freeman, wife of Mr. John Grant, died fifth of this month, age about forty years. M. Poncin, priest and M. John William Delisle who signed. This document, also found by Virginia Mason of Hampshire, England, is another remarkable discovery. This document has provide a clearer insight into the personal history of Richard Dobie, his wive and only daughter. Until this document surfaced, the only thing known of Ann Dobie was she was the daughter of Richard Dobie and an Indian woman named Ann Freeman; she married a John Grant, and had four children. This document declares Mrs. Ann Grant was about forty years years of age when she died, so she was born c1755. At the time, her father was about 24 and her mother somewhat younger. It would seem most of her life was lived in the Montreal area. At the time of her death, Ann and John Grant had four children ranging in age from twelve to twenty-one.